Terrorists shoot over 100 rockets since IAF killed Zuheir al-Keisi Friday, wound eight – one seriously. 15 Arabs reported dead. 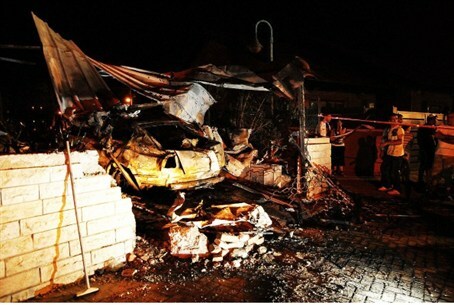 Gaza terrorists continued to pummel southern Israel with rocket fire on the Sabbath. They fired 11 rockets on Saturday, bringing the total number of launches to over 100 since the IAF killed Zuheir al-Qaisi, the head of the Popular Resistance Committees (PRC), on Friday. Al Qaisi was killed following intelligence that the PRC was about to launch a deadly attack on Highway 12, which straddles the border with Egypt. The IDF's English-language website counted approximately 135 rockets by 7:30 p.m. Saturday (Israel time), 74 of which struck within Israel. It said the Iron Dome system intercepted the rockets in 28 out of 31 attempts to do so. Eight Israelis have been wounded by the rockets. Most suffered light to moderate wounds. One, a foreign worker, was seriously injured. The Bethlehem-based Ma'an news service reported that 15 Arabs have been killed in IAF airstrikes over the weekend. IDF Chief of Staff Lt. Gen. Benny Gantz conducted a situation assessment meeting at the Gaza Division Headquarters Saturday morning. In the early afternoon, two PRC terrorists were killed in an IAF airstrike east of Khan Younes. Another terror squad was killed as it was about to launch a rocket. The IDF said in a statement Saturday morning that its aircraft had attacked six targets overnight: two weapons storage sites and two launching holes in northern Gaza, a weapons production site in central Gaza and a terror activity center in southern Gaza. The strikes are in response to the rocket fire at Israel. In addition, the IDF said, aircraft fired at a terrorist in central Gaza in the course of the night, and at six additional terror cells in northern and central Gaza. These terrorists were all making preparations for launching rockets at Israel. Accurate hits on target were identified. All IAF aircraft returned safely to their bases. The IDF is preparing for a continuation of the present escalation and estimates that it will last a few days. Highway 12 has been closed off to civilians because of the alert regarding a terrorist plan to carry out an attack there. The IDF is combing the route. The highway was reopened to civilian traffic less than three weeks ago, after it had been closed since August following a terror attack in which eight Israeli were murdered. Schools will be closed in Be'er Sheva Sunday. Additional communities may also decide to keep schools closed.